★★★★★ Bought this for my son-in-law for Christmas. It is a very nice-looking watch and is quite unique. Did not really know what to expect but it really looks great. I also like the fact that it has a regular leather band. 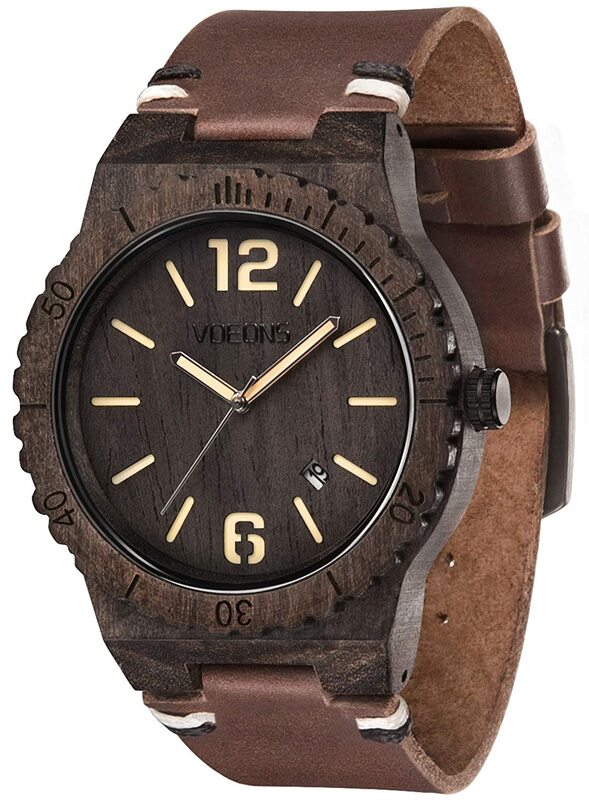 A lot of the wooden watches have wooden bands. I didn't quite know how that would work if the band was too big or too small. My son-in-law liked the watch. He had never heard of a wooden watch. ★★★★★ Got it for a guy friend who is allergic to metal. He thought it was a really cool gift and I've seen him wear it a lot. I was concerned it had a little bit of metal on the band, but he says it doesn't bother him. It looks more expensive than it is, too. ★★★★★ It is exactly what I wanted as a gift for my woodworking son. I was so pleased with the price and the product. I will definitely order from @VOEONS again. Works perfect but accidently tore the band off when got hooked on a nail.. I am reordering one. ★★★★★ My husband loves this watch. Good quality. The only thing is that the date on this is rather small and a little hard to read. It's a very nice piece. ★★★★★ Nice inexpensive watch to give my current watch collection a taste of something new. I really like this watch is easy to either dress up or dress down.